Ketchikan’s Pacific American Fisheries crew in 1929. Photo courtesy Melissa Stouffer. Melissa Stouffer recently shared two photographs with the Alaska Historical Society, depicting her grandfather’s time in Alaska. Roman Andres was born in Abulug, Cagayan, Philippines ca 1908. He traveled around the Pacific for several years, likely working as a migrant laborer. During this time, he joined thousands of other Filipino manongs in Alaska. 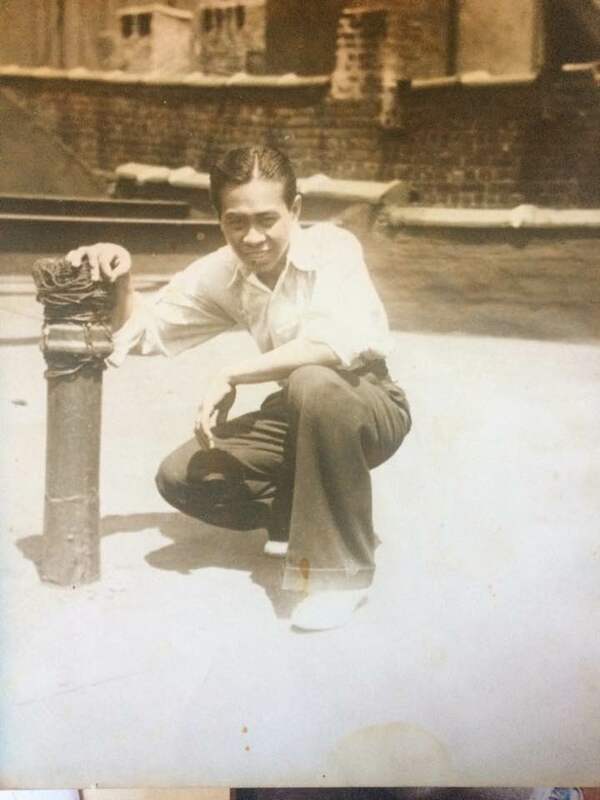 Manong, or uncle, is the term that describes this early generation of Filipino-American immigrants. Melissa knows little about her grandfather’s time in Alaska. 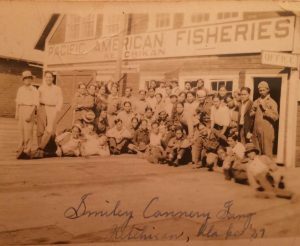 From the photograph labeled “Smiley Cannery Gang,” we see that in 1929, Roman Andres worked at the Pacific American Fisheries cannery in Ketchikan. “Smiley” is not referring to the happy faces of those photographed, but rather the previous name of the cannery. In 1916, J.L. Smiley built the cannery in Ketchikan. Smiley previously owned and operated a cannery in Blaine, Washington. In 1918, J.L. Smiley & Co. merged with other enterprises to become Wilson Fisheries Co. In 1928, the seafood behemoth Pacific American Fisheries purchased the facility in Ketchikan. Although the cannery was not officially named after Smiley for nearly twenty years when Roman Andres worked there, from the photograph we can see that the name persisted. Roman Andres. Photo courtesy Melissa Stouffer. It seems that Andres was a pensionado, or a Filipino student who was able to come to the United States to attend school. He graduated from high school in New York. 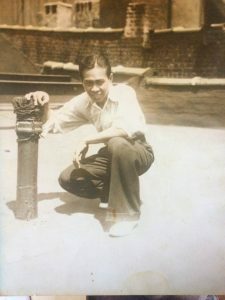 Later, he served in a Filipino regiment during WWII and returned to the US with a wife. Like many other Filipino-Americans of this generation, Andres worked in the food service industry. He settled in Mt. Clemens, Michigan and worked as the head chef at the Colonial Hotel. He died in 1972. Thanks to Melissa for sharing these photos that help to articulate the deep and longstanding connection that Alaska shares with the Philippines. No connoisseur of Alaskan history can dispute the impact of the seafood industry on this state, but as the canneries and cold storage facilities that once adorned the landscape disappear from sight and memory, the struggle to keep knowledge of the past alive begins. In an era of constant connectivity, information saturation, and Pokémon Go, the connection between the birth and growth of Alaska’s seafood industry and the contemporary cultural, political, and economic climate in Alaska becomes obscured. Seeking to document and preserve local seafood industry heritage for the benefit of future generations, The Sitka History Museum teamed up with the Alaska Historic Canneries Initiative in 2016. 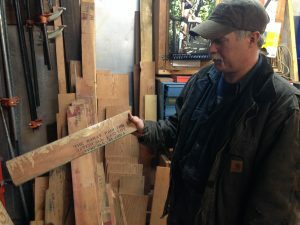 It all started over a year before when Sitka History Museum Executive Director, Hal Spackman, explored a fresh approach to the promotion of local history. The Sitka History Museum began working with KCAW, Raven Radio 104.7, 90.1 FM to produce Sitka History Minute, a short weekly radio program featuring unique and captivating stories from Sitka’s past. Harkening back to the golden era of radio, the show combines equal parts theatrical delivery, rich storytelling, and historical fact. A team of enthusiastic writers tackle every aspect of Sitka’s past, from the town’s one and only hanging to the infamous April Fool’s Mount Edgecumbe “eruption” prank. Most importantly, the program frees the past from the formality of museums and text books and plunks it down into the daily life of people from Port Alexander, Alaska in the south all the way north to Yakutat. The Museum sought and was generously awarded an Alaska Historic Canneries Initiative mini-grant to fund the production of a special series of Sitka History Minute episodes commemorating Sitka’s seafood industry history. With the airing of Part I of the cannery series in August of 2016, Sitka History Minute celebrated its landmark fiftieth episode. The series ran throughout the month and included a re-airing of Episode 12 on the Pyramid Packing Company. While Sitka History Minute strives to deepen the Public’s appreciation for local history, the radio program also has significant implications for the preservation of cultural heritage. 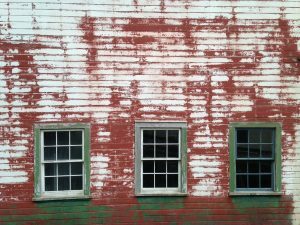 The in-depth research and documentation of oral histories that accompany the writing and production of each episode works to preserve a past that, like the historic canneries fading from Alaska’s shorelines, would be otherwise lost to time. The Sitka History Museum wishes to thank the Alaska Historical Society’s Alaska Historic Canneries Initiative for their sponsorship of the Sitka History Minute special cannery series and KCAW, Raven Radio 104.7, 90.1 FM for their continued partnership in the Sitka History Museum’s endeavor to promote and preserve local history. Links to the Sitka History Minute cannery series, including Episode 12 on the Pyramid Packing Company, can be found at SitkaHistory.org, or at KCAW.org/sitka-history-minute/. This year’s annual Alaska Historical Society and Museums Alaska conference in Juneau featured ample opportunities to share and learn about Alaska fisheries history. Historic Alaska Packers Association maps were on exhibit within the Father Andrew P. Kashevaroff building, in addition to a section within the brand new exhibits about the history of Alaska’s seafood industry. The following a synopsis of several of the featured presentations and projects. Bob King and Katie Ringsmuth spoke about their Alaska Historic Canneries Initiative-sponsored project to document the history of the Diamond NN cannery in Bristol Bay. Diamond NN is the oldest industrial fish processing site on the Naknek River. Bob and Katie hope to nominate the site to the National Register of Historic Places and curate several exhibits, including one about the 1919 Spanish Influenza outbreak in Bristol Bay. To learn more about this project, make sure to like Tundra Vision on Facebook. 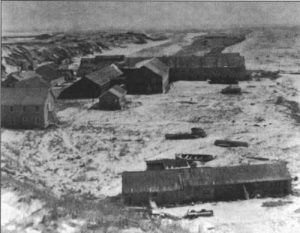 Listen to this APRN feature to learn more about the Spanish Flu in Bristol Bay here. University of Alaska Fairbanks College of Fisheries and Oceanic Sciences PhD candidates Maggie Chan, Elizabeth Figus and Sonia Ibarra joined Daniel Montieth of University of Alaska Southeast in a discussion about the opportunities and limitations of using historic and archival material to establish baseline scientific data. Maggie and Elizabeth are looking at halibut fisheries in Southeast Alaska, while Sonia is researching how people sea otter populations and ecology in Southeast. A Fisheries History Speed Talk session featured presentations by nine individuals, highlighting projects and resources related to fisheries history. Angela Schmidt of the University of Alaska’s Film Archive shared new film resources, including an acquisition from the Marine Advisory Program’s videographer and the Alaska Seafood Marketing Institute. Ross Coen spoke about the acquisition of the Seafood Products Association archive by the Special Collections at the University of Washington. This archive features information on the development of methods to enhance the quality of seafood production. The donation can be attributed to the efforts of the Alaska Historic Canneries Initiative to educate the seafood industry about the importance of preserving institutional records. 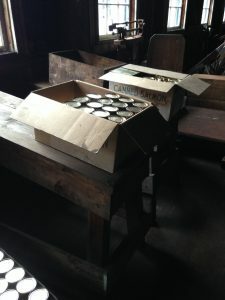 Karen Hofstad announced that she and Anjuli Grantham are collaborating to publish Pat Roppel’s work on the history of canneries in Southeast Alaska. Pat spent years compiling information but died before her work was finished. Her papers were donated to the Alaska Historical Library in Juneau. 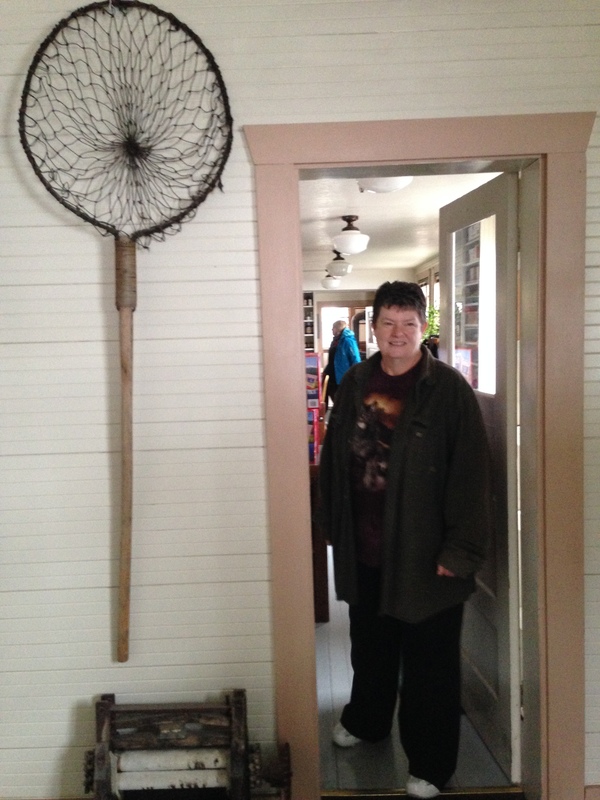 This effort to revive and publish Pat’s work will be a project of the Alaska Historic Canneries Initiative. Matt Miller interviews Katie Ringsmuth, Bob King and Anjuli Grantham. 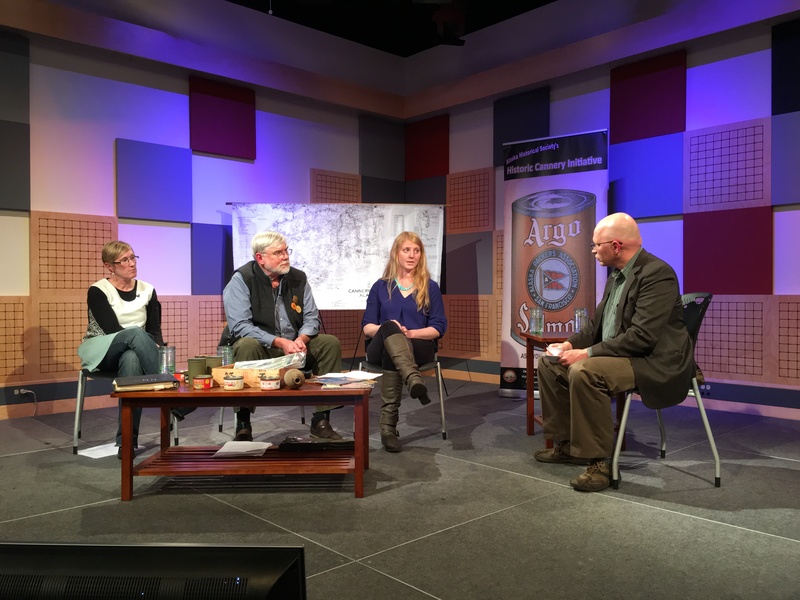 While in Juneau, Anjuli Grantham, Bob King and Katie Ringsmuth taped a show in front of a live studio audience for KTOO’s Forum@360. “Alaska’s Historic Canneries and the People Who Worked There” will broadcast on Friday, October 7 at 8PM on 360North. The full program is available for viewing at any time on KTOO’s website. Photos, text and audio production by Anjuli Grantham. The Waterfall Resort on Prince of Wales Island is a busy place in the summer. 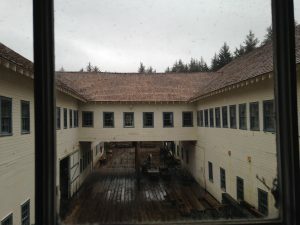 Dozens of guests at a time occupy the old cannery, turning a place that once produced canned salmon for the marketplace into a place that caters to sports fishermen eager to feed themselves. But if you venture to this historic cannery in the spring, you will only find a skeleton crew of carpenters and winter watchmen, engaged in keeping the cannery in prime shape. Wanda Wilks in the Waterfall Cannery store. 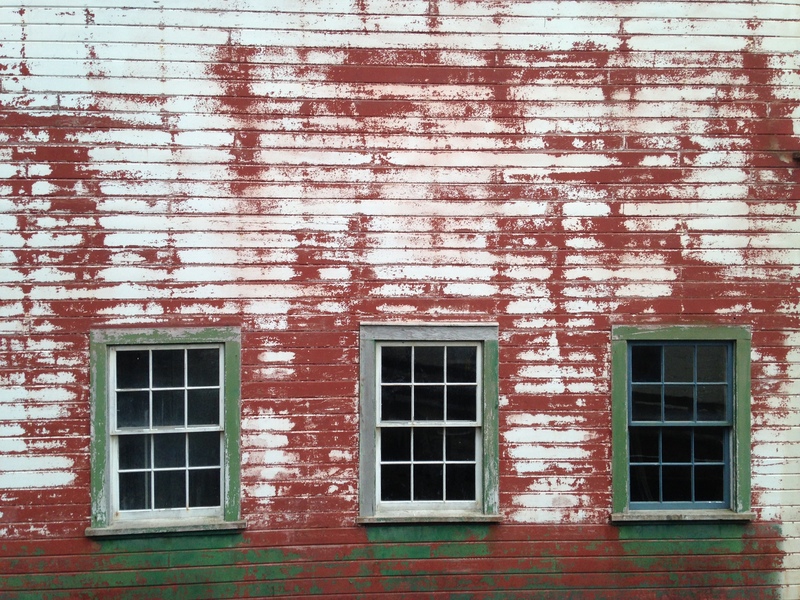 White, red and green paint on the side of a cannery warehouse. 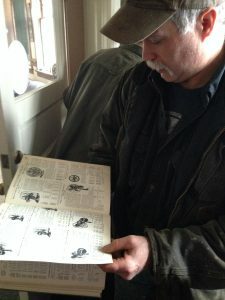 Babe Wilks looks through an old parts catalog in the Waterfall Cannery store. Special packing tables for casing up salmon. Babe Wilks holds a board stamped with Nakat’s stencil. Herman Kurth was the son of a long-time Waterfall superintendent. He’s returned to Waterfall to visit and signed the put his signature at the same spot in the warehouse he signed back in 1948. 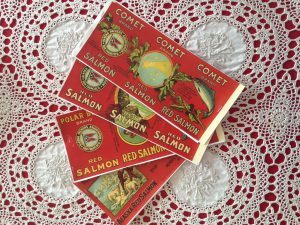 Petersburg resident Karen Hofstad’s salmon can label and tin collection overwhelms. It is so good, it’s difficult to know where to begin once perusing commences. 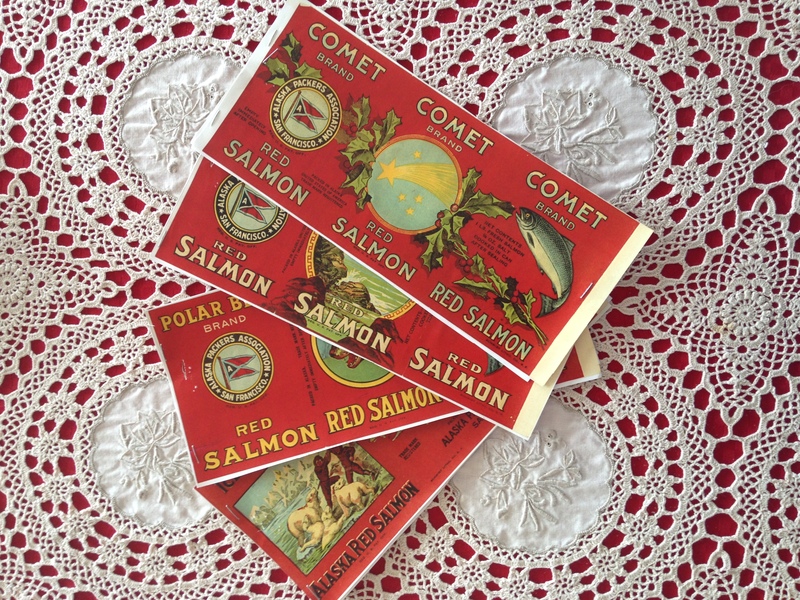 Should we start with the original, handmade tins from the early canneries along the Sacramento River or with the tins from the companies that consolidated to create the Alaska Packers Association in 1893? What about the pound tall labels, or the half pound cans, or the sample booklets of labels that salesmen would tout to store owners? When it comes to cannery ephemera, Karen has likely the largest private collection in Alaska. In fact, I am unaware of a collecting institution in the state that approaches the size and scope of her collection. Within the letter on the peculiar paper, Reed recounts his season, which was “wonderful” from the sounds of it, even if there were mishaps. He writes that a fisherman committed suicide on the trip north and severe weather delayed the bark by over two weeks. Yet once he arrived, Reed was clearly enamored with Ugashik, noting that “we had the most wonderful sunsets I ever saw.” He reported on the sled dogs, the mountains, the marvels of the cannery. He mentions the Spanish flu pandemic of 1918-1919, which left many orphans in the region. One 19 year old acquaintance was responsible for caring for three children who no longer had parents. The labels on which the letter is written. But he doesn’t speak much of the ship herself. The Star of Finland was constructed in 1899 and christened as Kaiulani. She was built in Bath, Maine and renamed when the Alaska Packers Association purchased her in 1910. 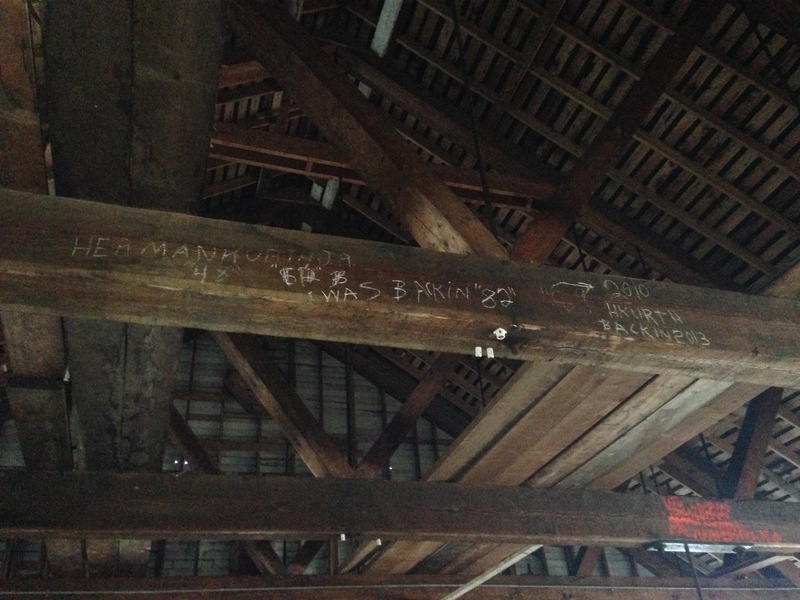 She was the largest 3-masted bark ever constructed in the United States. Although the vessel was comparatively spacious, she was likely crammed on the return trip. If protocol had been followed, the vessel would have been carrying part or all of the 2,000,000 cans of salmon that Reed reports were made at Ugashik that season. 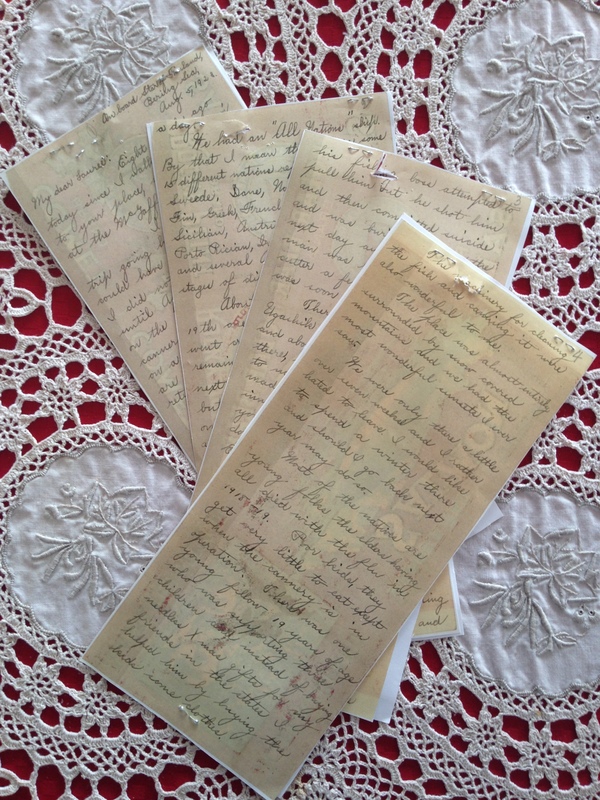 Those cans were baring the labels on which Reed wrote his letter. 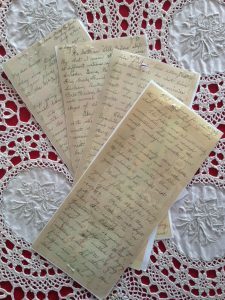 The letter doesn’t help to solve any mysteries regarding the history of Alaska’s canneries, but it does provide a compelling and brief synopsis of one worker’s fishing season, his perceptions and his prejudices. Read all about Reed’s experience in Ugashik in the transcription of the letter, below, and listen to the story aired about the letter on the Alaska Fisheries Report. Eight months ago today since I walked from Denny’s to your place, not being wanted at the McGaffic wedding. I had quite a trip going home and wish you could have been with me as I did not arrive in Frisco until April 19 and left on the 28th for the salmon cannery at Ugashik, Alaska on a sailing vessel, and we are now on the same vessel returning home. On May 10th we encountered a severe storm which carried away some of our sails and then we were bothered by head winds, so that we were 45 days in making the trip, which should have taken about 30 days. 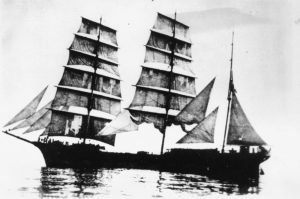 Star of Finland, from State Library of Queensland collection. Imagine 45 days without a bath. It makes me scratch to think of it. And only enough water to wash your face about once a day. We had an “All Nations” ship. By that I mean there were some 15 different nations represented, i.e. Sweede, Dane, Norwegian, Eskimo, Russian, Fin, Greek, French, Jew, Italian, Sicilian, Austrian, Mexican, Chinese, Porto Rican, Irish & German Catholic and several Americans in various states of dissolution. About midnight on May 19th, one of the Sicilian fishermen went crazy and cried for the remainder of the night. The next day he appeared rational but seemed to think that some one was going to kill him and asked permission to sleep in the donkey engine room which was given and the next morning they found that he had slept in the firebox of the donkey engine in a space so small that he had to curl up like a dog. He did this for several nights and one morning he refused to come out and his fishing boss attempted to pull him out, he shot him and then committed suicide and was buried at sea the next day and the injured man was removed by revenue cutter a few days later and was soon back on the job. There was nothing at Ugashik except the canner and about 50 natives who live there, several white men married to natives, Siwash Indians, which made them squaw men and innumerable dogs. I wish you could have seen the dogs, great big ones, regular Eskimo dogs. They hitch 7 to 9 of them up to make a team and they are quite a sight. I almost forgot the Eskimo family who spend the summer there and have a reindeer herd in the winter time. The cannery itself was wonderful. They made over 196,000 cans in one day and over 2,000,000 while we were there. Ugashik cannery in the 930s, from NPS. The machinery for cleaning the fish and canning it were also wonderful to me. They place was almost entirely surrounded by snow covered mountains and we had the most wonderful sunsets I ever saw. We were only there a little over seven weeks and I rather hated to leave. I would like to spend a winter there and should I go back next year, may do so. Most of the natives are young folks the elders having all died with the flu in 1918-1919. Poor kids, they got very little to eat except when the cannery is in operation. There was one young fellow 19 years of age, who was supporting three children and instead of buying needless Xmas gifts for my friends in the states, I helped him by buying the kids some clothes. Tell your Mother that I had a nice visit with Mrs. Bradshaw in Los Angeles and am writing her today also, and also spend a night with John Bradshaw’s son. Nothing preventing we should reach home early in September at which time this letter will be mailed and I would appreciate an early answer as I do not know how long I will be in Frisco. Hope you did not have to work very hard this summer and that everyone is well. With kindest regards to all, I am- Sincerely, S.E. Reed- 220 Golden gate Ave., San Francisco, Calif.